President Obama’s symbolic recognition of minorities isn’t a substitute for policy, but it does matter. Inaugurations are symbolic events, this year’s most of all. The pomp and circumstance was wholly symbolic because there was no transition of power, and the president and vice president had taken the official oath of office the previous day. The inauguration also neatly symbolized the layers of America’s racial history, as the country’s first black president was re-inaugurated on Martin Luther King Day, 150 years after Lincoln issued the Emancipation Proclamation. Infused with powerful and fraught symbols at every turn, January 21, 2013, was more a poetic text than a government event. We, the people, declare today that the most evident of truths—that all of us are created equal—is the star that guides us still; just as it guided our forebears through Seneca Falls and Selma and Stonewall; just as it guided all those men and women, sung and unsung, who left footprints along this great Mall, to hear a preacher say that we cannot walk alone; to hear a King proclaim that our individual freedom is inextricably bound to the freedom of every soul on earth. When the president name-checked the watershed moments of the women’s rights, civil rights and LGBT equality movements, he offered a powerful moment of official recognition. And recognition matters, even if there is no explicit policy agenda immediately attached to it. I am not implying that the Obama administration lacks a policy agenda to advance the social, legal and economic equality of those groups. And I am not suggesting that this speech is sufficient to realize that end, or that these rhetorical flourishes liberate the Obama administration from political accountability to these constituencies. Still, we can judge the value of this statement as a symbol separate and apart from any subsequent policy outcomes. It matters, in and of itself, because recognition is intrinsically valuable in a democracy. As I argue in my latest book, Sister Citizen, mutual affirming recognition is the practice that allows citizens to operate as equals. Typically, we think about justice in terms of distribution: how many economic resources, educational opportunities or political pathways, for example, are available to various groups and individuals. This is a reasonable but limited way to think about fairness. Citizens want more than a fair distribution of resources; they also desire—and are willing to sacrifice for—accurate, meaningful and mutual recognition of their humanity and uniqueness. I cringe at metaphors implying the similarity of the state and the family, but recognition is usefully framed in a familial context. Children experience connection to and fairness within the family in terms of opportunities for recognition, even if all children are given the same material resources. Fair parents observe, engage and recognize all their children just as surely as they feed, shelter and educate them. Members of a national body share a similar desire to be seen and recognized by the state. A system is not fair if citizens do not enjoy equal opportunities for public recognition. And this means recognition of all their identities, both the ones with which we are comfortable and the ones that make us anxious. All presidents use inaugural addresses to reflect on the American people. But naming citizens solely by their national identity ignores how identities like gender, race, class and sexual orientation profoundly shape what it means to be an American. For marginal and stigmatized groups, public life threatens the opportunity for accurate recognition. W.E.B. Du Bois characterized the recognition issue for black Americans by asking, “How does it feel to be a problem?” Ralph Ellison described it as being an “invisible man.” Betty Friedan lamented it as “the problem that has no name.” Gay Americans have long identified it as “the closet.” In each case, the challenge is the same: a lack of fair and accurate recognition. Our collective work is to provide space for that just recognition to occur. President Obama did so on a chilly January morning. Previous presidents have asked marginalized Americans to read themselves into the national story, but President Obama actively wrote these groups into our history. Obama positioned Seneca Falls, Selma and Stonewall as the fulfillment of a nascent promise in Jefferson’s declaration, and thereby recognizes the deeply American narrative embedded in these moments. Fair recognition and just distribution are not alternatives; they are companions in political struggle. The civil rights movement from which Martin Luther King Jr. emerged was as much a movement of recognition as it was of redistribution. Black people were organized for integration of schools, economic opportunity and political power, but they used a recognition strategy to get there. Marches, sit-ins and boycotts used black bodies in new ways. Segregated labor, housing, education and public space allowed black life to occur in the shadows, far from the consciousness of most white Americans. The civil rights movement forced the country to recognize the accomplishments, the sufferings and the humanity of black people by making their experiences starkly visible and claiming the right to be recognized. Being seen was part of the struggle. Being seen is still part of the struggle. 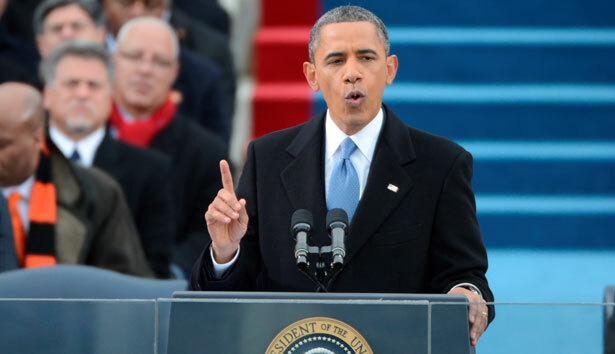 President Obama’s inaugural address is yet another step in the long march toward fairness.